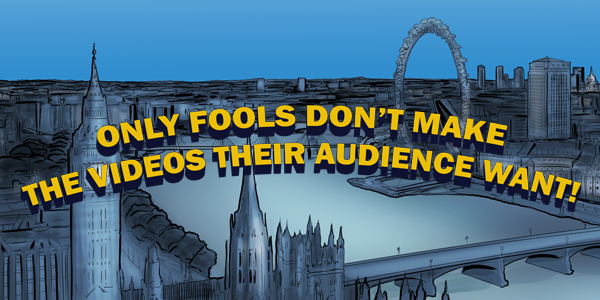 Only Fools Don't Make The Videos Their Audience Want! As a business owner, anyone should know better to give their consumers what they want to make sales. All the successful products and services you see out in the world that are continuously being sold are down to the fact there is a demand from consumers. Youtube also runs this same process with videos. I remember having a client a while back who use to say to me ‘Daniel, I don’t understand why my videos aren’t getting more views or subscribers or conversions’. when I looked at his videos (I will keep him anonymous) they were things I didn’t feel anyone would want to see. This tends to happen a lot, that individuals feel they should use Youtube differently in their business, rather than following a similar process of giving viewers what they actually want. So I then asked him if he ever asked his viewers what videos they wanted to see. He responded “no way! surely that shows weakness?!’. Another misconception of Youtube..For your channel to thrive and grow, your ego must be put aside and deem it OK to ask your viewers what they want. Most of the time you find you get completely different concepts and ideas to what you THOUGHT they wanted to see. In the long run this will pay off big-time. Now depending on how big your business or brand is, your online community size may vary. But it doesn’t mean you should neglect your followers who are clearly interested in your content. By respectfully asking your viewers and even prospects what content they may want to see, you demonstrate just how much you care about your subscribers and the value you want to bring to them. Content created for the viewers will of course give your viewers more valuable content to watch. In regards to the Youtube Algorithm, this is a huge factor in seeing your channel promoted more in retargeting, and retaining viewers to keep coming back to watch more content and videos. Inevitably leading to more views. Lastly, if your videos are more relevant to your audience, especially the conversion videos, then you’ll find not only is there a greater level of rapport to you, but you are more likely to convert your viewers to buy from you. They can see you’re someone who listens to and respects their audience and provides content that they want to watch. Continuously growing an online community with a high retention of views, subscribers and conversions. If you would like to discover how Youtube can be used as part of your business, or would like some feedback on videos you may already be producing, then why not get in contact.